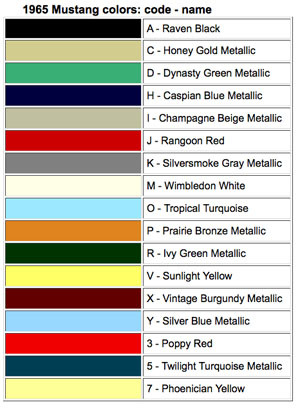 The 1964 1/2 to 1965 Mustang Paint Colors included 16 choices. Although concours correct enthusiasts have designated early 1964 production cars as a 1964 1/2 Mustang, the paint codes are the same for the entire 1965 Ford model year. You'll find below, a color chart showing the 1965 Ford Mustang color codes and their actual colors based on the Ditzler paint book for the 1965 model year. These are based on the factory codes from the data plate which is riveted to the drivers side door. If your original data plate is missing or damaged, it's not the end of the world. There are several restoration parts companies out there that are selling a nice reproduction plate that you can order, with information from your the data plate. If you don't have that information, you may have to piece it together from what's on your car, such as the axle tag, and what's left of your interior. Usually finding Mustang paint isn't too difficult, but it seems that some counter people rely too much on the computer and not the book with the chips. In the past there were more or less 4 types of paint, being Acrylic lacquer, Acrylic enamel, Lacquer and Enamel. Now you have epoxy, and low VOC paints. Plus you have one step and two step (base coat/clear coat). Where I live, they're just in the process of eliminating the solvent based paints and going to the low VOC, which are water based. If you're not painting your own car, it may not be too much of an issue, but there is a significant paint cost difference depending on what you choose. And this is going to reflect on the cost of your paint job.